Photograph depicts the Pacific Coast Terminal in New Westminster, British Columbia.Stevedores gathered around crane trucks parked beside ship; bow of ship "HAWAIIAN PLANTER" partially visible in right corner; heavy fog over water. 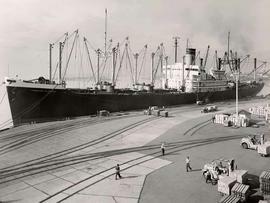 Photograph depicts the Pacific Coast Terminal in New Westminster, British Columbia.Two forklifts and a truck crane parked in front of ship; cargo being moved; men on ground in front of ship; men gathered on right side of ship. Photograph depicts the Pacific Coast Terminal in New Westminster, British Columbia.Stevedores gathered around crane trucks parked beside ship; ship's name "PACIFIC NORTHWEST" visible on hull. 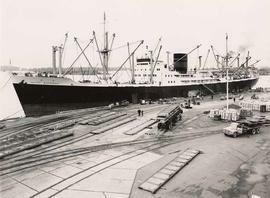 Photograph depicts the Pacific Coast Terminal in New Westminster, British Columbia.A forklift and a truck crane parked in front of ship; gangplank lowered to dock; stevedores supervising the movement of cargo. Photograph depicts trucks being loaded at the Pacific Coast Terminal.Flat bed truck being loaded by a crane in foreground of image; forklift and pallets behind truck; ship with name "PACIFIC NORTHWEST" on hull in background. Cargo of British cars on the SS "Mostun"
Photograph depicts a cargo of British cars from "Mostun".Bird's eye view of four stevedores lowering a British car to the dock from the "Mostun".This photograph is associated with Empire Stevedoring Co. Ltd. Photograph depicts a cargo of British cars from "Mostun".Four stevedores standing with car being hoisted from ship; hull of ship and gangplank in background.This photograph is associated with Empire Stevedoring Co. Ltd. Photograph depicts a cargo of British cars from "Mostun".Bird's eye view of five stevedores lowering British car from "Mostun".This photograph is associated with Empire Stevedoring Co. Ltd.